Remember When Portraits is so excited to share one of our 2019 goals with you. 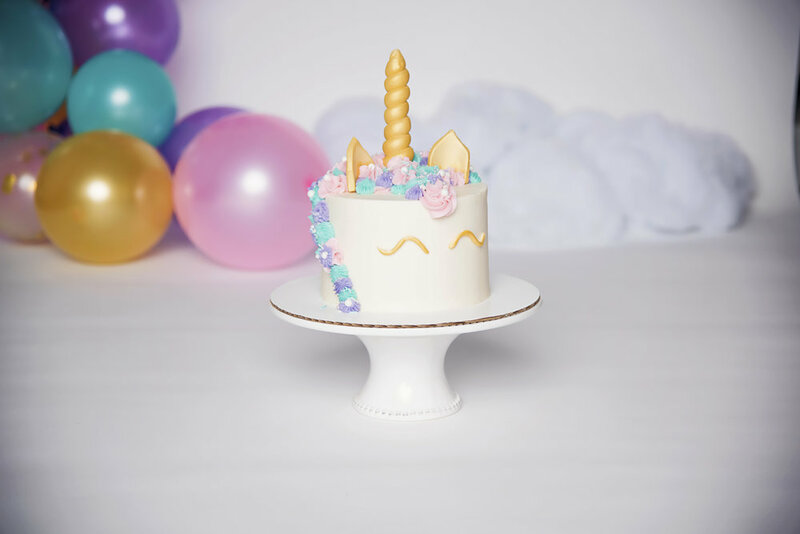 Our goal is to bring you 10 themed cake smashes that we have never done before to show you what we are capable of doing. We plan to be doing model calls throughout the year looking for 11-13 month olds, boy and girls, when we are ready for that next set up. You can find our model calls on our community group on Facebook under Remember When Portraits. I have to tell you though, I have a love/love more relationship with cake smashes. By far these are my FAVORITE sessions when little ones are involved. You get to see and document them enjoying the glory of all calories at an age where they are learning about everything. You get to see them enjoy or dislike immensely the texture, taste, smell and look of the food product put in front of them. They get to take in the sights, get messy and enjoy foods they have mostly been told they aren’t allowed to partake in. It is kind of glorious and special to be the photographer to share this moment with these little ones and their parents. On the love more side, you have to know how much preparation can go into these sessions. Our studio coordinates the ordering of the cake, including discussing design and color. 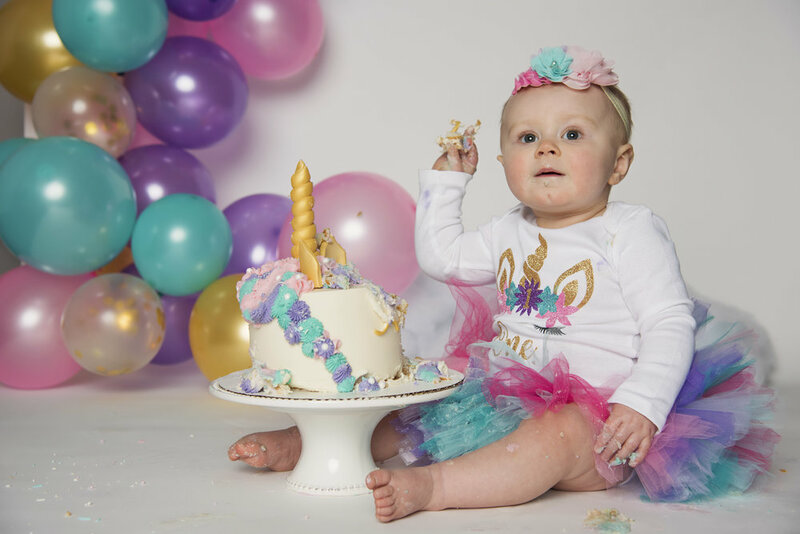 Color is actually really important to get right as if the cake doesn’t match the outfit or the backdrop this creates a LOT of work in photoshop for us. We are talking it could be hours of time we simply won’t get back because we didn’t communicate the design from the get go. Planning all these little details and allowing our creative juices to flow is what I love most. We spend at minimum an hour prior to your arrival decorating the set. This includes any items needing to be shopped for like fresh veggies and bread for our spaghetti smash, wrapping of presents or decorating boxes to fit that Mario Bros. theme behind your child or creating snowflakes and white paper garland for that Buddy the Elf set up, and even making the balloon garland by hand. We also work with our clients to select and order your child’s costume or outfit for the shoot. We make sure we hit the budget and get everything delivered or picked up on time. It all takes time and time is valuable. 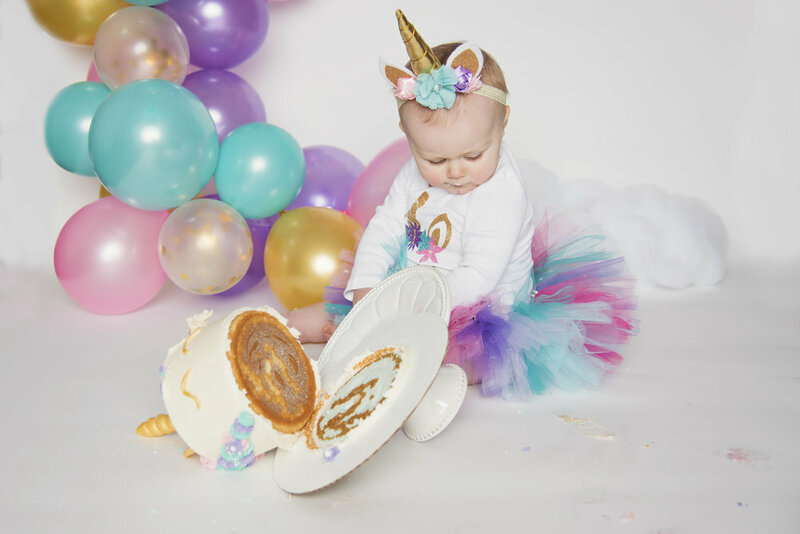 That is why we offer 2 different cake smash packages: one that is simple that we can whip up the hour before you arrive or the turn key session where we do it all for you, spending hours coordinating, designing and planning every last detail where the only thing you have to do is show up with a well rested little one! 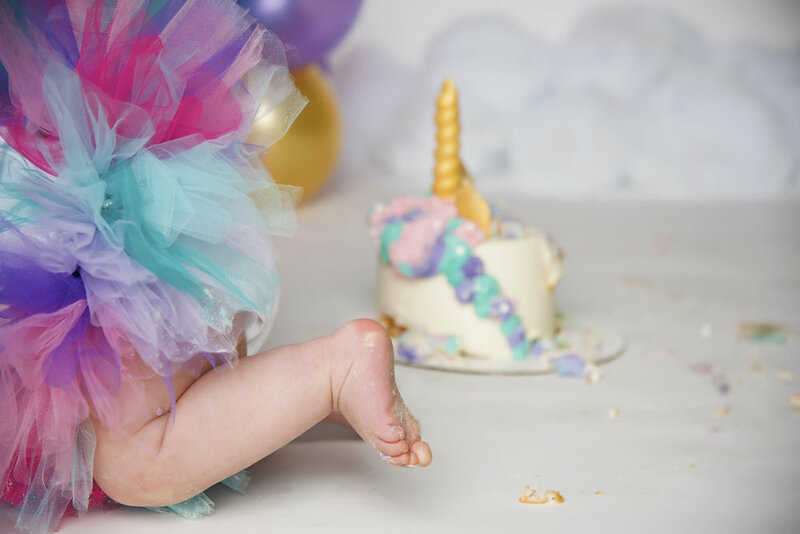 If you are interested in scheduling a cake smash or food smash session for your little one, contact us at april@rememberwhenportraits.com and let us know what you had in mind! Here is one we did last week. 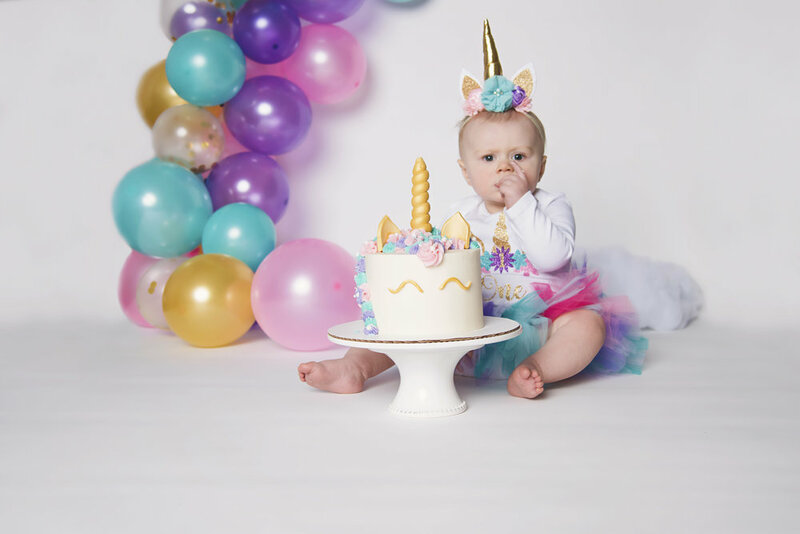 We partnered with Stephanie’s Cupcake Company in Maineville, Ohio for the gorgeous unicorn cake that our little model tore into with ease. I mean can you blame her? It is funny how fashion changes over time. We can reminisce about how a style comes from a certain decade invoking certain memories or how we pray another never comes back into style ever again. Because history tends to repeat itself, it is not a surprise that those 1980’s sweaters we were all forced to wear still are in style today. Well, in a different purpose anyways. Every Christmas season those old sweaters emerge from the back of our closets to be worn as ugly Christmas sweaters once again. Thankfully over the years the designs of sweaters have become more holiday festive and even more fun to wear. From bands having their logos embroidered on them to funny quotes to homemade sweaters to even animals wearing sweaters, the options are endless! Even now people host parties simply to see who wears the ugliest sweater. Thankfully we aren’t all dressing like Carlton from the Fresh Prince of Bel Air daily anymore! This time of year many of my friends break out their favorite Christmas movies in anticipation of Christmas. Some do the movie countdown on TV and others pull out the DVD’s. To be honest, I am not a big TV or movie watcher, but at Christmas time I LOVE watching Charlie Brown’s Christmas. Last year I finally relented due to my kids non-stop requests and digitally purchased the movie Elf. Move over Charlie Brown because there now competition for the top spot on the favorite list! To enjoy this new favorite Christmas movie I decided to have some fun with the theme for all of you to enjoy with me! The quotes from the movie Elf are ENDLESS and the details of Christmas flow throughout each scene. From the garland made of white paper to the Christmas carols all the way down to the food choices - they all scream Merry Christmas to me in a silly style I just love. My favorite scenes are when Buddy sings in the bathroom, decorates Gimbels overnight, takes out the kids in the snowball fight and then makes his famous breakfast. My family loves to remind some of these to belly laugh a few times every time we watch it! Based on Buddy’s breakfast this year I decided to allow his crazy creation to be the inspiration of a fun shoot at the studio. Armed with everything from the elf costume down to the sprinkles on the bed of noodles, we tried to capture the spirit of Christmas - all the fun and anticipation that it brings - in photographs. Thank you to our little elf model, Evie, for being a good sport! 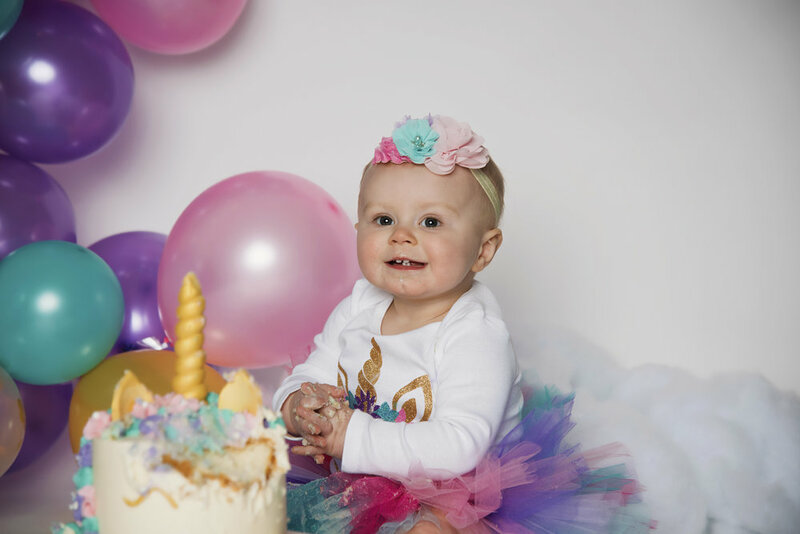 If you would like to schedule a fun, themed cake or food smash with our studio, please contact us at april@rememberwhenportraits.com. We are open to all ideas! No age limit on fun either! The day before Thanksgiving everyone is itching for a long weekend, some time off, great food and to be able to wear sweatpants with no shame. I, with the rest of you, cannot wait until tomorrow. With the anticipation of a fun filled long weekend, I can’t help but sit back today and reflect over how thankful I am for so much in my life. Almost all of the photos in this blog post show families and friends together, enjoying one another and sharing the moment they are present in. A few show a single person who many are thankful for. Thanksgiving does that to you. It makes you realize the glass is half full if not overflowing in abundance in your life. Thanksgiving gives us the opportunity to choose gratitude. For some, gratitude comes easier than others. I know for me I tend to choose gratitude more so in hind sight. Sometimes it is hard to see the blessings in front of you in the moment. It takes discipline to choose gratitude daily. Lately though, given personal circumstances, I have found gratitude to come easier for me. Even if gratitude doesn’t come naturally to you, you can still give thanks. Our days are filled with never ending opportunities for us to practice making gratitude a habit. 1 - I am thankful for access to healthcare. Those that know me personally know our family’s world has been flipped upside down due to health issues. Because of our access to caring doctors, specialists and talented surgeons, members of our family are on their way to living a better quality of life. 3 - I am thankful for my children, for assuring me that I am smarter than a 5th grader and for teaching me how to unconditionally love. 4 - I am thankful for my family in Michigan, who have gone above and beyond in the past couple of months to show their support with constant calls, texts, visits, and assistance to our family - even going so far as to traveling 4 hours tomorrow providing and cooking Thanksgiving dinner for us to assure we aren’t alone or go without. 5 - I am thankful for our community, for rallying around our daughter to offer well wishes, meals, visits, donations, calls, messages, packages - you name it, you all provided for her and us during a very trying time. From previous CRHP sisters to MND to the Moeller Band Family to our St. C parish community to the Maineville Small Business Networking Group to neighbors and friends to people in the community at large - you all are the real MVP’s! I am grateful for each and every one of you. 6 - I am thankful for the ability to serve others through my gift of art, for being selected by many to help them to preserve their memories in photographs. 7 - I am thankful for transportation that is safe and runs the way it should without issue. 8 - I am thankful for music and the ability to hear, for songs on the radio, for live concerts and local performances, for music teachers, music lessons and how every day our home is filled with music. 9 - I am thankful for the ability to learn through technology and all at the touch of my fingertips. 10 - Lastly, and most importantly, I am thankful for grace - as a believer, without God’s grace I would be nothing. If you have read this blog post - Thank You. I hope it inspires you to choose to be grateful and be present tomorrow while enjoying your Thanksgiving holiday with those who matter most to you. Don’t be afraid to share with one another reasons you are thankful! Welcome to No-Shave November! The month where the weather grows cold, we all bundle up more and the razor meeting the skin gets postponed for a while. But why? What is so special about November? Is it to keep us warmer and protected on those cold, blistering days? Or is it to accept the challenge of bringing awareness to cancer? Let’s learn more. “The goal of No-Shave November is to grow awareness by embracing our hair, which many cancer patients lose, and letting it grow wild and free. Donate the money you typically spend on shaving and grooming to educate about cancer prevention, save lives and aid those fighting the battle.” - Quote from the No-Shave.org website. The No-Shave November non-profit started in Chicago in 2009 by the children of Matthew Hill after he passed away from colon cancer. The No-Shave November organization has raised over $2 million to date through donations and by selling bracelets and t-shirts online. One of the differences between Movenber, which was started in the UK, and No-Shave November is that women can participate in the No-Shave November movement as can beards. It isn’t only for the mustache wearers of the world! To join in on the No-Shave fundraising, check out www.no-shave.org and sign up today. Ashley began her career as a researcher at the University of Cincinnati in the criminal justice department. Her specialty was studying women who were involved in the criminal justice system. Over the years Ashley noticed that she was often the only woman present in meetings with leadership at the criminal justice agencies that she worked for. However, when she would go in and train line staff, she would see a room over half full of women. As a result Ashley’s passion evolved into helping not only women who were clients of the criminal justice system, but also women who worked in the criminal justice system. Over time, she expended her work to all women in the workplace because she saw that this was not unique to only her field, but to all fields. Bauman Consulting Group is headquartered in Loveland, Ohio and takes on clients all over the globe. “Technology has made it possible for us to coach clients or consult with clients anywhere. Sometimes we travel to our clients, sometimes our clients come to us, and sometimes we meet virtually either over the phone or via web-based video meetings.” Bauman Consulting Group offers individual coaching, group coaching, individual and team assessments, facilitates workshops and retreats, and help agencies create policies and procedures that are more supportive of their women employees. Bauman Consulting Group focuses on empowering women to live the lives that they want. Many women find themselves watching life rather than actively experiencing the life that they want to have. Ashley shared, “Not every woman out there wants to be a CEO or a Board President. Some women want to have a job they enjoy and a great work-life balance. Others want to stay at home while their children are young and then find a meaningful career when their children are older. My goal is to help women find what makes them happy – to find something they are passionate about and to make sure they are successful doing it.” Ashley shared that there are so few resources out there for women that allow them to find their own drives, but her consulting group sees that there is no “one path” that makes them happy. There is no perfect answer for everyone – just what is perfect for you. Bauman Consulting Group’s focus is unique because they take a collaborative approach with their clients. They know a lot about the subject matter – they have studied it extensively, but they also know that you as the client have a lot of expertise in your situation. Therefore, they do not come in with all of the answers. Instead, they want to work together with you to create a solution that will work for you. There are no answers that work for everyone and it takes a team approach – one where Bauman Consulting Group really partners with each client – to develop the best approach for you. Keep in mind that coaching is for everyone – not just CEO’s or people on yoga retreats. It is a way for you to really be the best you can be at whatever is important to you. Coaches are not therapists, but they are a support system, an accountability network, and a partner in your personal and professional growth. Ashley would love to hear from you if you are interested in working with her and her team. She is offering a complimentary 45-minute coaching call with her to see if you might like being a coaching client. You can even schedule online on Bauman Consulting Group’s website. There is a discount available now through December 20, 2018, to receive 20% off coaching services. The coupon code is: FALLCOACH18. This week is national business women’s week. To celebrate I am going to introduce you to a few business women I know here in the Greater Cincinnati area who are power houses! I want to introduce you to a friend of mine who recently has gone into business for herself. Her name is Janine Faber (Med, RDN, LD). Janine is registered dietitian, nutrition consultant and a media spokesperson. Janine received her Bachelor of Science degree in Dietetics from Miami University in Ohio and attended Virginia Tech’s Dietetic internship in Northern Virginia. She also has a Master of Education in Health Promotion from the University of Cincinnati. She has been awarded the Produce for Better Health Supermarket Dietitian of the Year in 2014, the Ohio Academy of Nutrition and Dietetics Recognized Young Dietitian of the Year in 2008 and the Kentucky Beef Council Outstanding Service Award in 2013. Janine, tell us a little bit about yourself and your business. I am the president and founder of Janine Faber Nutrition, LLC . My company focuses on retail and product marketing, health professional outreach and corporate and community training and education. With my extensive background in retail nutrition, I provide sound nutrition solutions via engaging media segments, cooking demonstration and presentations leading to improved health outcomes, increased store and product loyalty and positive sales results. I can also provide nutritional analysis for companies and organizations. Tell me how you got started in nutrition. My grandfather was a family physician in Lancaster County, PA, and he would share stories with me of his interactions with his patients. He built good patient-doctor relationships often being the primary doctor for many generations in a family. You could see his enthusiasm with the field of medicine, the research and helping people. He was very proud of his position. With his stories, I became interested in the healthcare field and helping people. Then, I took a nutrition course in high school and was immediately hooked on nutrition and how important balanced nutrition is in our lives for various health conditions, sports performance and everyday energy. This is when I found there was a position where I could use these passions together, as a registered dietitian. That is fantastic! I can imagine your career is extremely rewarding being able to have such a positive impact on the individuals and community you serve. Can you share with us what is the most rewarding part of your career? I love interacting with people and providing nutritious solutions for families. As a mom myself, I know mealtimes can be stressful for parents, so I try to provide resources and recommendations to make it less daunting. I enjoy providing ideas for quick weeknight meals which a family can make and enjoy together or a new way for kids to enjoy more fruits and vegetables. The best reward is when someone says their family tried my idea or recipe and it was a hit! I can easily relate. Mealtime is a struggle it seems at all ages when you have kids who are picky or reluctant to try new things! What are some of the most common questions or concerns that potential clients come in asking you? The most common questions I receive are regarding how families can eat healthier and how to prepare fast, budget-friendly, healthy meals and snacks. Speaking of clients, what area or location do you serve? I provide on-site presentations, media segments and cooking demonstrations for businesses and organizations in the Greater Cincinnati area. I also can provide educational resources, marketing content and recipes with brands all across the US. Why would a business or organization choose your business to work with? What sets you apart? With over 14 years of experience in the retail industry as a dietitian for Kroger and Meijer, I have extensive experience working with businesses, brands and consumers. I enjoy inspiring others through nutritious meals and tips via tv segments, presentations, social media, cooking demonstrations and written articles and blogs. I have been featured in 100+ media segments on local FOX, ABC, CBS stations and their affiliates. I am also very active in the nutrition community as an active member of the Academy of Nutrition and Dietetics, Greater Cincinnati Dietetic Association, Ohio Academy of Nutrition and Dietetics and Ohio Nutrition Council. I am a past president of the Ohio Nutrition Council and currently serve as an advisory board member for the Miami University Dietetic Program. With all that you do currently, what else do you have time for? What keeps you busy when you are not working hard on your business? When I am not working, I am out with my kids (2 years old and 4 years old) on adventures to the zoo, amusement park, aquarium, grocery store, farmer’s market or going for a walk around the neighborhood. You can also find me cooking in the kitchen and trying to squeeze in working out and food photography as well. How can readers contact you for further information? Thank you, Janine, for allowing Remember When Portraits to highlight your business this week during National Business Women’s Week in 2018. Many wishes for a prosperous and healthy upcoming year! Are you recently engaged? Do you like winning giveaways and having new experiences to create memories of? If so, we have the giveaway for you! Remember When Portraits is offering an engagement session giveaway running Saturday, October 6th, 2018, through Saturday, October 13th, 2018. The lucky winners will receive an engagement session, up to 1.5 hours, and 2 fully edited digital files as a “Thank You” for being a part of our growing portfolio! More details can be found, including how to enter at: She Said Yes! We look forward to learning more about your love story soon! I never knew my heart would bleed the color purple. Purple is a nice color, but it is not my natural favorite color. I am not instinctively drawn to it. However, the color purple signifies for me, and sadly many other women in our society, much more than a pretty color. It has grown on me – not because I wanted it to, but because of being a victim of circumstance. The month of October is Domestic Violence Awareness month. It is recognizable by the purple ribbons and light that shines to spread awareness of this quiet societal problem. The purple began being used to signify women back as early as the 1900’s. It stands for elegance and royalty. My own experience with domestic violence happened in my 20’s. I learned the hard way that a narcissist and an empath never mix well together. After nearly dying at the hands of someone I loved simply for recognizing the gas lighting, the manipulation and lies, the isolation of myself and most importantly the loss of my own self value – I found the strength to build an exit plan and I was able to leave. Unfortunately not many are as lucky as me. It isn’t as easy to leave as one would think. September 11, 2016, was a somber day for our nation just like all 9-11 anniversaries are. As a nation our red, white and blue runs in unity through our veins as we remember those who suffered. However, for me the color purple bled more than any other color that day. My friend was killed in a murder-suicide by her ex-husband. She had it all. Her life was on the up and up with so much more great things to come. The pain my body felt knowing she was no longer with us, no longer going to be here for her children, no longer going to be my business soul mate sister, no longer going to be across the hall from my studio forced me to my knees that afternoon. One of the biggest struggles I had processing her untimely and unfathomable death was the survivor’s guilt I felt. Why her and not me? She wasn’t done bringing her goodness into the world. It wasn’t fair. I realized in that moment just how very lucky I was to still be living to tell. Two years later I have connected with many domestic violence survivors and have mourned many others whose light was taken away too soon. I have come to grips with my survivor’s guilt by continuing to chase my dreams just as my friend always did and pushed me to do. I still get little reminders she is watching over us all. Between the songs, the peacocks and the color purple I know she isn’t a statistic. She lives on through the rest of us who are honored to bleed purple. If you or someone you love is being abused by a spouse, domestic partner or loved one, know help is available. Contact the National Domestic Violence Hotline at 1−800−799−SAFE(7233) or TTY 1−800−787−3224 to get help 24/7/365. Treasure every moment. They only stay little for a little while. Some day you will miss this. As parents we have all heard these clichés a time or two. However, none of them ever ring so true as they do when your baby starts their senior year of high school. The whirlwind of emotions and "busy work" in preparation of this final year in high school leaves both you and your senior ready for it to end yet praying it won't all at the same time. 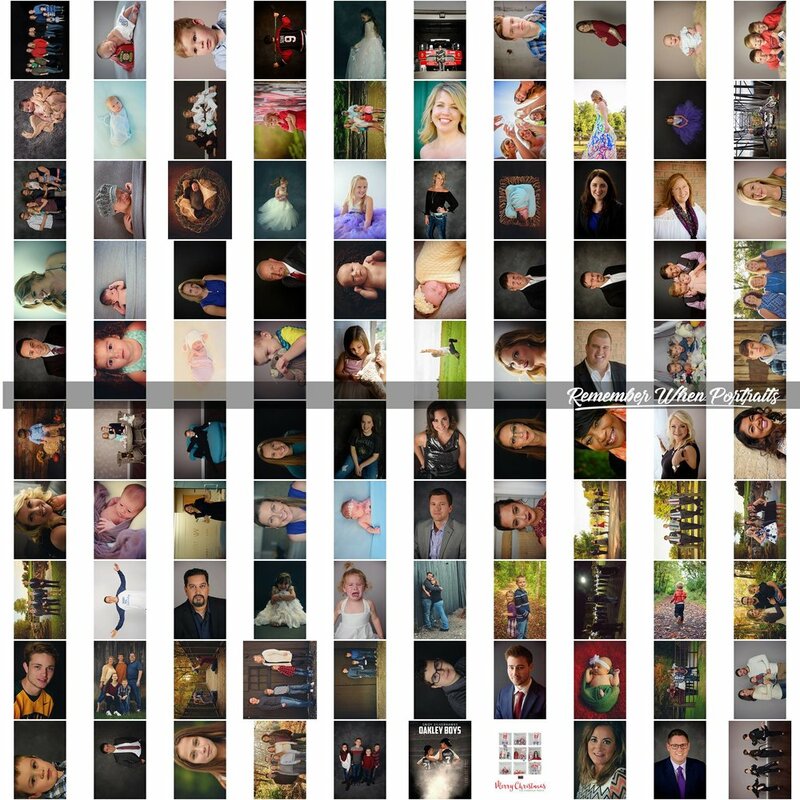 One of the biggest parts of senior year is coordinating senior photos. There are so many questions: When is the yearbook deadline? What should I wear? Can I hide all these teenager battle scars? I am so scared to be in front of the camera, do I really have to? Do I really need them? What will they cost? - The questions are endless and rightfully so! Remember When Portraits is here to help you navigate through all of these questions! Even more importantly, we are here to help you remember to slow down and enjoy the process. Part of our process is to purposely meet with you before scheduling your session to assure you are comfortable with working with us before we even pull out the camera. We want you and your baby to actually enjoy this experience as these are the memories of one of their biggest life accomplishments so far! We help you put into perspective how quickly (or not) you will need to book to assure you have plenty of time to hit your school's yearbook deadline. We talk with you about outfit ideas and ways to assure you will look timeless instead of trendy in retrospect in your photos. Our studio takes the time to remove any blemishes or marks on the skin that you won't see on any other given day. We understand how frustrating being a teenager is and we assure when you look back in 30 years on your senior photos you won't see any of those teenage battle scars! Do you need senior photos? Honestly that is up to you. No one can make that choice for you. However, once the time passes you can't get a re-do. When in doubt it is better to have them done than to always wonder if you should have. Should of's and could of's never win ball games! Remember When Portraits offers a full service experience that it customizable to your working budget. All of our products are available al a carte´ and there is no minimum purchase. We sleep well at night knowing you are only purchasing what you LOVE and NEED! We are currently booking fall senior sessions with local senior students. You can schedule your complimentary pre consultation with us by hitting the BOOK NOW button up above. Come in and meet us at a time that works best for you and see if we are the right photographer for your senior portrait needs! Do you guys like free stuff? Do you have a friend or family member who wants their portraits taken? Lucky for you we’ve officially started a Remember When Portraits Referral Program! It’s as easy as filling out a short form—we want to know a little bit about your interests so we can give a more personalized gift as a ‘thank you’ for sending clients our way. You don't have to even be a current client or have had portraits done with us before to register! We hope you enjoy the new program! We’re excited to show you some gratitude. This past weekend we tried something new: cake smashes! The shoots with the kids went amazingly well—we were able to see four small clients enjoy making a huge mess! 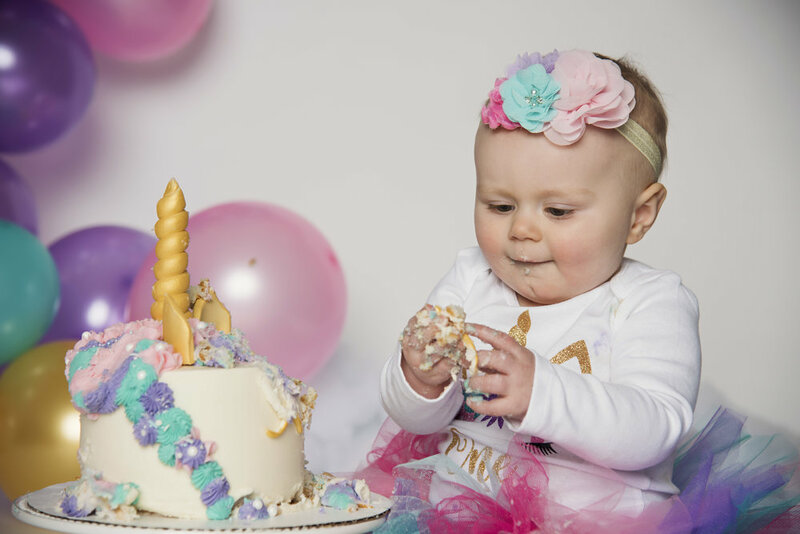 A few of the shoots were traditional ‘first birthday’ set-ups, but we had one two year old in attendance, proving that age doesn’t matter when it comes to eating cake and having fun. The cake smashes were so much fun that we’ve decided to add them to our line up with three radical packages! Krazy Kitten Krafts provided us with banners for each shoot, dialing up the level of decorations from fun to fantastic! With the purchase of one of the larger packages, one of those banners will be yours for the designing and taking. How awesome is that?? Over the past year and a half I have had the pleasure to get to know a local small business owner, both as a client and as a peer. Karie Lacy came to the Maineville area with a dream of bringing hair designs and styles to life in our community. Gussied Up by Karie Michelle came to life right across the hall from our studio in the Maineville Professional Building. Together we have co-marketed with back to school photos and hair cuts, worked side by side at the Maineville 4th of July Parade and most recent at the Shop the Village Event in December with the LMIS PTO. Gussied Up has grown leaps and bounds since coming to our community. It has grown so much that Karie shifted gears last month by announcing she was moving 5 minutes up the road to a new location - one big enough to expand her service offerings to give her clients (including me!) a full luxury experience. Gussied Up is now located at 383 S. Main Street South Lebanon, Ohio 45065. It is right next to the bike trail and just minutes away from Target, Lowes, Kohls and Starbucks right off of 71. Karie’s new space offers a snack bar and a front porch for those coming for an appointment, doing a walk-in appointment or just taking a break from being out on the bike trail exercising. Here is a photo of Karie’s new space, but you can see the entire new space make over on her facebook page https://www.facebook.com/gussiedupsalon/ or by stopping in during normal business hours to check it out in person! Currently Karie is looking to bring on another stylist through a booth rental opportunity. If you or someone you know is looking to branch out into a self-employment opportunity, please contact Karie directly by phone: 513-403-7943. Karie, I have enjoyed watching your business grow since we first met. I cannot wait to see the new space in person and experience the excellent customer service and styling in your new location that you have always given me! I am seriously so happy for you and the grow Gussied Up has experienced. We will miss you at the professional building, but I cannot wait to see how much your business will thrive in its new location! Cheers to a job well done! What Legacy Do You Want To Leave Behind? At the start of the new year many people excitedly anticipate the beginning of many new things: a new time of year, a new diet, a new job or a new journey to embark on whether personal or professional. We take time out to reflect, to make changes and to challenge ourselves to be an even better rendition of who we were the previous year. One of the things we can all do to better prepare ourselves on the cusp of such change is to assure we look the part of who we want to be. This isn't in reference to being shallow or something we are not. However, it is about putting our best face forward. Our personal portrait shows who we are and who we are capable of becoming. It shows how successful we have been so far and also outlines where we are headed in the future. As they say, a picture tells a thousand words. We all could stay status quo in our lives, but we all know full well the only thing certain in life is change. Whether you are looking for a promotion at work, sadly going through a divorce, treasuring some time with family and friends or just being present in the moment this year - exist in photos. Keeping your headshot or profile photo current and of high quality online might not seem relevant, but when no one knows who is going to see it tomorrow it becomes even more important that you make your best first impression before you even realize it matters. Tell me, what legacy do you want to leave behind for others to see? Happy New Year! Can you believe it is 2018 already? I cannot believe we are almost already at mid month. It is going by so quickly! I wanted to share some exciting news that we have going on at the studio for 2018. First and foremost, I want to THANK YOU for continuing to support our photography studio. We are approaching our 3rd year in business this year and we know it wouldn’t be possible without you! Last year we photographed over 80 different sessions that included individuals, families, newborns, model calls and corporate clients. Our goal this year is to photograph over 120 different sessions in 2018 by offering you a full service experience that allows you to enjoy being in front of the camera. This past week we have added on an intern to our staff. Jackie Haynes with the DAAP program at University of Cincinnati will be working with Remember When Portraits through April 2018. Jackie brings a high level of painting experience and fine arts education to the table. Jackie will be focusing on design content, video creation, client interaction and photography assistance. This year we are going to be sharing more information on the following: cake smashes for the littles, more hair and make up appointments in studio with sessions for women, a Senior Model Call program, a corporate head shot program for your staff, and ways we are partnering with our community. We also are going to be rolling out a Referral Program which will include your opportunity to provide testimonials to earn studio credit! Please help me in welcoming Jackie to our studio and keep a look out for more information on ways you can be a part of our studio’s journey in 2018! Back before I started my own business I was in corporate America like many others. I had a marketing degree, but I wanted something more. Something more creative and fun. How I would love to wake up every day and get paid to have fun! Who wouldn't want that??? Ok, not every day is all glitter and rainbows, but I would say my line of work is a close second. Let me explain why. Every day that I have the opportunity to photograph someone or be a part in the evolution of a digital negative file and turn it into the vision I see in my head - well that to me is fun! I never dreamed of actually being a photographer. I honestly wanted to be a graphic designer. However, when I went to get my certificate that nicely complimented that marketing degree I realized the world of photography. My first class was an introduction to photography and the rest is now history! The creative process for me starts even before I turn on my camera. I plan out the session, location or set itself. I consider colors, themes, lighting and the end result I am trying to obtain. All of these elements are ways for me to control or let loose in my creativity. However, that isn't were the creativity stops! After a session I get to take the digital negative files and begin the post editing process. How do I do that? I use Photoshop to help me mold what you might see versus what I see when I am taking a photo. Many people think that Photoshop can fix anything or solve any problem you may have. Sadly that isn't always the case. Not everything can be "fixed" or "altered". Sometimes it is a lack of information on the digital file. Sometimes it is simply a bad photo. Sometimes the changes requested are simply not realistic and may even cross ethical boundaries. Photoshop is a great tool, but one that as a photographer we have to use carefully and with a lot of thought and skill. Let me share with you a quick story. Last weekend I took photos for my extended family. After the session I was browsing through the images on the back of my camera to confirm with my brother-in-law we got them all. We came to one set and he asked me if these would be good enough because he was concerned as to how they looked. I assured him these were not edited yet and all I was looking for was the right foundation for me to get to work with. This small conversation is exactly why it is worth hiring a professional. My job doesn't stop when I hit the shutter-release button. Let me show you some of the examples I have in my portfolio of the post processing work I have completed! Newborn Photoshop Before & After. Yes, that is my foot in the original! From Suburbia to the open road! Light skin touch up and smoothing, brightening teeth and eyes and clean edits to brighten the image. All done to compliment the subject without taking away her natural beauty! I will admit I LOVE post processing. I love the challenge. I love the frustration. I love the rewards of my hard work. I love seeing the before and afters, just as much as you do. I hope you enjoyed them as much as I enjoyed creating the end result! Next week when all of those brave souls enter the retail market to shop for some of the lowest prices of the year, you can stay in your pajamas to shop with us! Remember When Portraits wants to give you a better, more memorable experience by allowing you to shop with us without the lines or need to leave your home. We also want you to enjoy Thanksgiving dinner with your family. Therefore, the gift certificate sale will NOT be LIVE until the clock strikes midnight! All gift cards purchased will also come with a complimentary session (valued at $100) for the recipient so you are guaranteed that the value of the gift card goes directly towards the finished products of their choosing. What a great deal! The sale will run through Cyber Monday. This is a ONCE A YEAR sale! After Cyber Monday gift certificates will be available for purchase at face value without anything else attached. There is a new group of kids lurking around Little Miami Schools this week. You don't know their names nor their affiliation to one another. They may be someone you sit at lunch with, play flute with in the band room or it may be the baseball player sitting across from you in math class. However, this group of ordinary kids just made today a little extra-ordinary with their kindness antics. This morning when Little Miami Junior High students got into the building they were greeted with Post It Notes. Post It Notes everywhere. On their lockers, on the walls, in the bathrooms, even on the garbage cans! Why Post It Notes? Because each Post It Note brings a little bit of kindness to each beautiful student and staff in this school. It reminds them they they are important, loved, beautiful, and matter. How did this get started? It all started with a girl and her mom who really enjoys seeing other people happy. Together they rallied up some friends and created Project Kindness LM! In our crazy world it is very easy to get lost in the negative and forget that kindness is free. This small, anonymous group will continue to remind their fellow classmates, the entire school district and our community that a little bit of kindness goes a long way. Stay tuned here for more blog posts about this group as the year goes on! If you are on Instagram make sure to follow @projectkindnesslm for real time updates. At the end of the school year, Remember When Portraits will be hosting a reveal party for the team members of Project Kindness LM, inviting each member of the group to our studio to photograph everyone and to celebrate their hard work sharing kindness in our community. Please share this blog post to those in our district to help spread the word to those students on the team as none of them know this is happening and we have no other way to notify them because they are truly anonymous! Once upon a time there once was a little girl who dreamed to live like a princess. She wanted to wear beautiful gowns, satin laced slippers, a dab of make up to accentuate her natural beauty and a crown on top of her head to signify royalty. She envisioned moments of dancing like a proper princess; beautiful classic music playing in the background, surrounded by tall walls filled with windows overseeing rolling lawns and beautiful gardens as far as your eyes could see until they kissed the horizon afar. The older the little girl got, the less she dreamed dreams similar to what she would read in her fairytale books. She began to lose the childhood spark that allowed her to get lost in her own imagination pretending to be anyone she wished she could be as she matured and grew older each year. Eventually one day that spark wilted out just like a candle at the bottom of its wick. After many years of living in a cold and cruel world, facing many sad realities, that little girl began to remember and long for her innocent childhood dreams. The ones that made her feel alive, taking her to new places that were safe to explore and to experience, while simply being lost in her own imagination. The wonderful little girl realized that although she was no longer a child free to daydream anytime she wished to, she was able to control her own destiny and very capable of bringing her childhood dreams to life. She realized she herself had become a story teller through her craft just like the authors of all the many books she read and built her dreams around. Because of her craft she was able to allow other little girls, who were still in those innocent years, and even those little girls trapped inside adult bodies, to experience their own princess dreams! Hence the birth of Girls Dress Up Sessions and Women's Before & After Sessions! Check out our video below showing our women's before & after transformations along with a video showing our Girls Dress Up sessions. I had the honor of photographing the Myers family earlier in October. This was the second time that I have photographed Nathan, Ashley and their little man, Cooper. Over this time I have gotten to know them and have enjoyed getting to watch Cooper grow in front of my camera. The Myers currently are working hard in support of Nathan’s run for Hamilton Township Trustee in our community. Having gotten to know Nathan and Ashley prior to his announcement to run, I have to share some small things I know about him and his family to help paint a light of the simplest fact – they are great people! Nathan and Ashley are big UC basketball fans. They are out and about in the community whenever they can be. Whether it is enjoying Kings Island together, the neighborhood park or swimming with Cooper (as he LOVES to swim! ), they are a very active family. I have to admit I admire their love for Halloween and the thought and planning that goes into their family – yes family – Halloween costumes! The other part about the Myers family is their hearts of giving. Monthly they are donors to St. Jude. Nathan has also been a big advocate and supporter for Urban Success Mentoring Organization here in greater Cincinnati. Urban Success Mentoring Organization provides crisis intervention for domestic abuse and human trafficking victims. This organization is very near and dear to my heart as I am an active team member of this organization. Through people like Nathan, USMO is able to remove victims from their abusers and get the help they need to start over in healthy lifestyles. Over the past year I have also watched Nathan grow as a candidate for Hamilton Township Trustee within our community. I applaud Nathan for his compassion towards members of our community. He has spoke with individual community members 1:1 about his ideas and plans that he wants to implement to build a great sense of community. He has attended small business meetings and engaged with business owners in the community to offer support and listen to our needs. He has also been very vocal about his support of our school district and our community parks. These are some of the key “hot buttons” that matter to many in the community. I cannot persuade anyone myself to vote one way or another as we all have the right to vote for the candidate we feel is best. However, I do have to say after spending time with Nathan, Ashley and Cooper, I am very happy to be able to vote for Nathan as it takes more than just a name on a ballot to earn my vote. I am more interested in who the candidates are as people and how they go about their daily lives – both professionally and personally. I am confident if Nathan is elected that he will serve our community well. In turn it was my pleasure to serve his family this fall season by photographing their “Remember When” moments last month! If you or anyone you love or know is currently the victim of domestic abuse or human trafficking please contact Urban Success Mentoring Organization at 513-508-1171 or visit www.urbansuccessmentoring.org for more information.